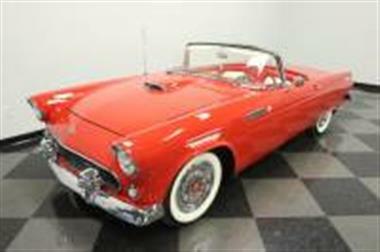 First generation Thunderbirds are all about styleand#44; and this 1955 T-Bird does it the best. With an unbeatable factory color combinationand#44; amazing interiorand#44; immaculate V8 under the hoodand#44; and overall exceptional clean presentationand#44; this is desire on wheels. 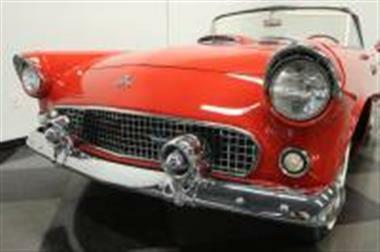 Its so cleanand#44; and so well restoredand#44; it just might be the finest first-year T-Bird weve ever had at Streetside Classics – it truly is that nice!<br /> <br><br> These first-year Thunderbirds are true icons. 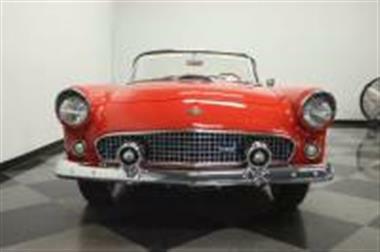 It only gets better when its in the factory-correct color of R-code Torch Red. The cleanand#44; brightand#44; distinctive paint leaves a lasting impression that complements the Thunderbirds legendary long and chrome-laden look. The car looks pretty originaland#44; which is the product of a frame-off restoration that had the goal of making you feel like you were picking this up from the Dearborn factory in 55. 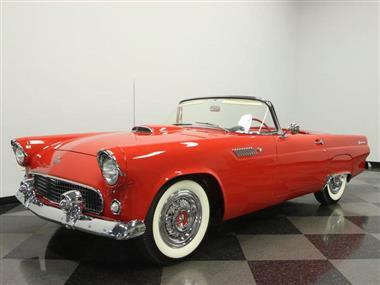 This is the kind of appearance that will slow traffic especially with its new contrasting black folding soft top in place – so you were not the only one to stop and stare at this red T-Bird. Factory wheel covers with red and chrome tie this package together perfectly. 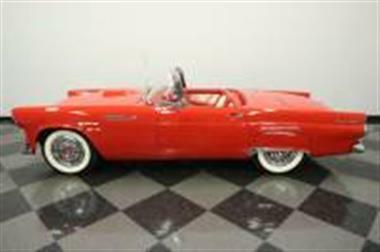 <br /> <br><br> Just as the cool whitewalls add a pristine touch to the red exteriorand#44; the white accent color looks great with the red interiorand#44; too. The overall effect is a striking combination that will have people complementing you about how clean the interior looksand#44; and many will swear its a custom creation (but its actually factory-correct!) 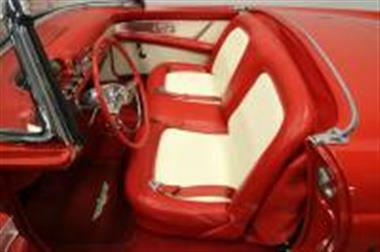 Style and luxury were the true hallmarks of this classicand#44; and thats why it comes with rare features for its time like the four-way power seat. The factory AM radio has been converted to AM/FM and heat/defrost sliders are all displayed in a machine-turned panel that flows across both doors and the dash. This frames the power steering wheeland#44; and above it is the nifty speedometer thats lit from behind by a Plexiglas panel viewed through the windshield. Just to the left of this is the tachometer and to the right is the working clock. 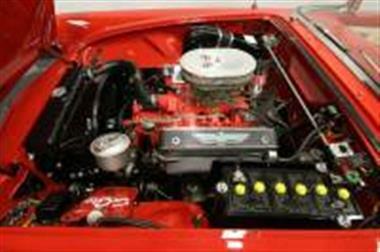 So yesand#44; there was just as much attention and investment in the interior as the exterior during the full restoration.<br /> <br><br> The Thunderbird Special 292 cubic-inch V8 looks authentic right down to iconic Thunderbird logo valve covers. Just like interior and the exteriorand#44; the engine bay is expertly presentedand#44; so you know its ready for the car show. Its a powerhouse of a motorand#44; but it doesnt lose its luxury-minded attitude as it sweetly purrs through bumper-mounted dual exhaust system. The three-speed automatic transmission stays comfortable as it clicks through the gears without a fuss. Plusand#44; the power steering and supple suspension mean this is great cruising classic.<br /> <br><br> We can show you all the documentation that comes with the sale such as the restoration receiptsand#44; maintenance recordsand#44; and owners manualand#44; but really all you have to do is look at the undercarriage photos. The immaculate condition of a place that hardly anyone sees is a clear indication of thoughtful restoration and a cut-above classic. This is the kind of car you can pick up from us on a Saturday and win your first trophy on Sunday. 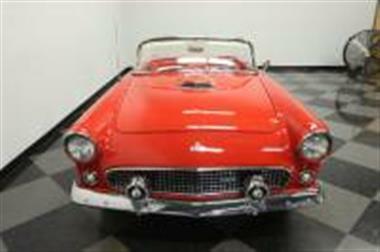 So hurry before someone else snaps up your perfect T-Bird. Call today!! !